Experience the capital’s highest hotel at Shangri-La Hotel, At The Shard, London, residing on levels 34 to 52 of the iconic 95-storey Shard tower. This is the only five-star luxury hotel in London Bridge, contrasting sleek modern style with the area’s rich historic character. Boasting unparalleled views, our hotel offers 202 luxury rooms and suites, three signature venues for dining and drinks, three river-facing event venues, as well as the Sky Pool and the 24-hour Sky Gym on Level 52. Enhance your occasion with the most dramatic views of any London event space. At Shangri-La Hotel, At The Shard, London, we offer the city’s most high-profile destination for executive gatherings and diplomatic meetings, as well as social events and weddings. On Level 34, we have a total of 400 square metres / 4,306 square feet, including three private venues and the spacious Sky Lounge. All feature floor-to-ceiling windows with panoramic views over the city and the River Thames. For business meetings and social gatherings, we welcome from 10 to 140 guests in an atmosphere that feels intimate and exclusive. For bespoke weddings, we can host civil ceremonies and receptions for 20 to 110 guests. The grand staircase and double-height windows behind it present a dramatic view over London, providing an ideal backdrop for wedding photographs. Our dedicated Shangri-La events team takes care of every detail from beginning to end, ensuring perfection with our experienced hosts, state-of-the-art services and tailor-made menus. Our three private venues are named after the first three of five constant virtues of Confucianism: Ren for benevolence, Li for propriety and Yi for righteousness. • Ren: Overlooking the River Thames and the City of London through floor-to-ceiling windows, Ren is our largest function space, hosting 140 guests for receptions and 110 for banquet dinners. Measuring 155 square metres / 1,668 square feet. • Li: Looking out over London Bridge and St. Paul’s Cathedral, Li is a sleekly elegant venue, welcoming 35 for receptions and 30 for banquet dinners. Measuring 47 square metres / 506 square feet. 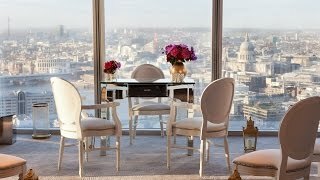 • Yi: With floor-to-ceiling windows, this intimate boardroom looks onto Tower Bridge and the Tower of London. It’s perfect to host 15 for receptions or 12 for formal dinners. Measuring 15 square metres / 161 square feet. • Sky Lounge: Perfect for private cocktail receptions, this spacious lounge boasts a soaring ceiling and double-height, floor-to-ceiling windows. The area features its own bar and a dramatic wine and champagne wall, which houses the UK’s largest collection of Cristal Champagne by Louis Roederer. The furniture is versatile and may be kept or removed, depending on the event. Measuring 200 square metres / 2,153 square feet. • GŎNG Sky Pool: For private events, it’s possible to reserve a section of GŎNG Bar and the adjoining Sky Pool on Level 52. Available in the evenings after the pool closes, the space is perfect to host a reception for up to 60 people. Imagine a live DJ, lights floating on the water and sparkling floor-to-ceiling windows with spectacular views across London. The London Bridge area offers the most convenient transportation access, whether by foot, car, boat or rail. Steps away, London Bridge Station is one of the city’s most important transport hubs and connects you to London’s major airports. From London Heathrow, it is 60 minutes away, London Gatwick 30 minutes and London City Airport just a fifteen minute journey.